Macy’s Inc., reflecting a cautiously progressing international agenda, will open the first Bloomingdale’s in Kuwait in spring 2017 through a licensing arrangement with the Al Tayer Group. Even though the opening is a year away, oil prices are expected to remain low for the foreseeable future and create economic pressures the region hasn’t seen in generations. But that’s an issue Al Tayerofficials contend will not affect the long-term viability of retailing in the region. The Bloomingdale’s store will occupy 93,000 square feet over three levels in the 360 Mall, a six-year-old upscale center in Al Zahra. The 360 Mall, developed and owned by the Tamdeen Group, houses such brands as Cartier, Gucci, Bottega Veneta, Prada, Burberry, Jimmy Choo, Tory Burch, as well as Gap and Abercrombie & Fitch. The Bloomingdale’s store will be a tightly edited, scaled-down version of the typical Bloomingdale’s department store in the U.S. and similar in size and merchandise content to Bloomingdale’s in SoHo. The focus will be on advanced contemporary and designer ready-to-wear, footwear and accessories including handbags and jewelry. There will be no men’s wear, children’s wear or home products. Macy’s has been criticized in some circles for being late to the international arena, but made its first move overseas in 2010 by opening Bloomingdale’s in Dubai, which is also licensed to Al Tayer. Last year, the corporation revealed that Macy’s will open its first overseas unit, in Abu Dhabi in 2018, in the mall where a Bloomingdale’s will also open that same year. Those two stores are licensed to Al Tayer as well. In addition, Macy’s is working on launching an e-commerce site in China on Alibaba Group’s Tmall Global. “Bloomingdale’s in Kuwait is another step forward in our strategy for capitalizing on the international potential of Macy’s and Bloomingdale’s, both of which are well-known retail brands around the world,” said Terry J. Lundgren, chairman and ceo of Macy’s Inc. Lundgren said the corporation is continuing to learn “how best to translate” Macy’s and Bloomingdale’s for international customers. Spring told WWD that the decision on Kuwait was based on the experience working with Al Tayer and the performance of the Dubai store. Spring described the arrangement with Al Tayer as a typical licensing partnership, where Al Tayer owns and operates the store, and Macy’s Inc. receives licensing fees and royalties based on sales. The difference is that Macy’s Inc. maintains a “close collaboration” with Al Tayer on the design and merchandising of the stores. Licensing enables Bloomingdale’s to expand internationally with a partner who knows the market and its consumers. It’s less risky than owning overseas stores though there is a sharing of the profits. “As you look at other parts of the world, you have to find those partnerships and real estate opportunities that provide chances for growth. I wouldn’t rule out more of an international presence for Bloomingdale’s over time,” Spring said. 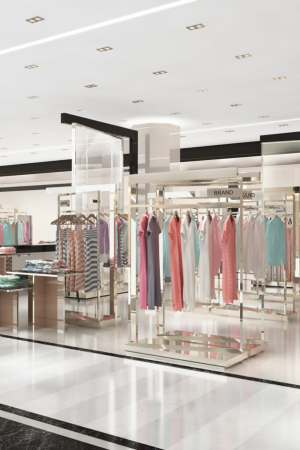 Spring described Bloomingdale’s Dubai as “one of our top-performing stores. It’s highly productive and is a great expression of the Bloomingdale’s brand.” Macy’s Inc. does not disclose the individual volumes of its stores. While opening international stores does pose new challenges, an overseas agenda with greater momentum seems desirable given the difficulties many U.S. retailers are facing at home due to declining tourist spending and Americans shifting their spending habits away from fashion and toward restaurants, spas, traveling and other experiences. In Kuwait, Bloomingdale’s will have “a significantly different assortment” from other Bloomingdale’s, largely due to what it won’t carry, said Jack Hruska, Bloomingdale’s executive vice president and creative director. He said the store will be “the market leader” in beauty, advanced contemporary and designer women’s apparel, footwear and accessories. “It’s a small store that’s going to overstate these three categories,” Hruska said. Some brands inside Bloomingdale’s will be exclusive to the market. The mix is still being determined. The store will also have the familiar Bloomingdale’s signature interior design with the checkerboard floors and black framing around vendor presentations. Bloomingdale’s and Al Tayer will create a more “upscale and comfortable” array of personal shopping suites, and a big at-your-service beauty area for private consultations. The goal is to provide “a better experience and respect cultural norms,” Hruska said. While Bloomingdale’s in Dubai caters to a local resident customer base as well as the highest level of tourism in the region, the Bloomingdale’s in Kuwait will be much more dependent on affluent residents, according to Al Tayer. Bearing that in mind, Kuwait will amplify personal shopping and concierge services to encourage loyalty including comfortable and convenient changing rooms, Al Tayer said. In Abu Dhabi, Bloomingdale’s, as well as Macy’s, will be in the “super-regional” Al Maryah Central development on Al Maryah Island. Both stores are scheduled to open in spring 2018. Macy’s will have a 205,000-square-foot, four-level store there while Bloomingdale’s will open a 230,000-square-foot unit. Al Tayer agreed there could be further opportunities to open Bloomingdale’s in the Mideast, but like Spring, expressed caution about the future. “We are very particular about protecting the Bloomingdale’s brand and making sure it is in the right city and the right mall,” Al Tayer said. Al Tayer Group, based in Dubai, is involved in several sectors including automotive, contracting, distribution, retail and services in 12 countries. The group represents more than 600 brands.